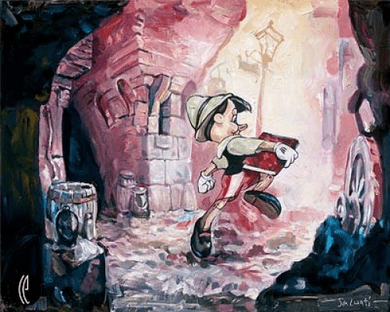 Jim Salvati Handsigned and Numbered Limited Edition Canvas Giclee: "I'm a Boy - Pinocchio"
About the Artist: Born and raised in southern California Jim grew up surrounded by art and architects. His southern California influence is prevalent in his work. The Ocean, Surfing and the movie studios are a major part in his life and career. Jim has worked with most of the Movie and animation studios in southern California and continues to work with Disney and Warner Bros. On a regular basis. He has been painting and designing for the entertainment and advertising business for over two decades. But beyond his excellent artistic skills, his greatest talent lies in his artistic development skills. His talent as an artist is being able to take ideas and thematically bring it to visual reality. He has been associated with artists devoted to this kind of acumen ability. As a byproduct of his years as an instructor at the prestigious Art Center College of Design (since 1985) he has a strong connection to artistic diversity as well as a careful observation of the changing world of art and how art interrelates with technology. His experience and knowledge cross many boundaries into Print, Film, Animation, and the fine arts. His extensive client list includes Disney, Warner Bros., Sony Pictures, Paramount pictures, Queen Mary, Radio City Music Hall, Castle Theater, Fox Pictures, and Gatcha Sportswear. His Palette of oils has inspired him to create a new look that has energized his love of the old painters with the combination of the great Walt Disney Studios. "